Have you come across such a situation where you are hesitant to do something? Have you ever felt awkward to talk to someone? It means that you are a shy person who feels insecure in tough situations and talks less to people. Talking less is not the issue but running away from situations is not acceptable. This shows that you have lack of confidence and are counted in the weaker section of the society. Initially you can avoid situations, but you cannot carry it for a long go. People will suppress you at every point if you don’t open up and take a stand for yourself. It’s a kind of bad habit and can be overcome with certain practices which are to be carried out regularly. 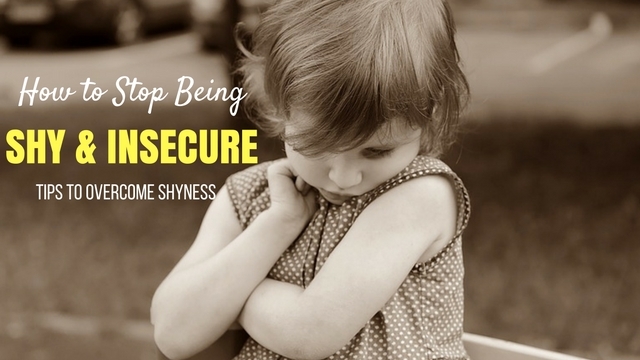 The following mentioned are few tips on overcoming fear and how to be more confident by getting over shyness. The first thing that you should consider doing is change the environment or the workplace where you work. It is seen that you are bored at one place and moving out helps you to get some fresh air so that you can concentrate on yourself. Your surroundings define your mood. A good surrounding will always have a positive impact on your body and mind. You will be able to think better and likewise can work better. It is seen, a good and positive workplace have made the employees more productive and the work presented by them is also fruitful. Hiding away will not help you in improving your shyness, you need to move out of the environment that is making you shy or where you can’t open up with others. Always find such crowd which is making you happy and where you can easily mould yourself. Look for a good company. Change your position in your workplace. Sometimes it happens so that you don’t know the reason for which you are running away from a particular, you avoid meeting others and also are not comfortable attending social functions. Have you ever wondered why? The reason being you have not tried to identify your weaknesses that makes you low in front of others. What are the things I always try and avoid? What makes me feel insecure? Why do certain people disturb me? Why can I not face my own problems? Write down the points which makes you unconfident. Doing so will help you identify your weakness. You yourself have to make effort and transform those habits. Sitting alone in one corner is not the solution. Weakness if overwhelmed from the beginning will prove to be adverse. Talk to people. Sharing your thoughts can help you gain self confidence in yourself. You can talk to any person in your neighborhood, in workplace, school or college. Talk about any topic that is trending or anything that is interesting to the other person. But make sure that you choose the right person. The other person won’t feel bad if you talk and they won’t judge you. Just go and talk. If you are shy to talk face to face, then start texting. Nowadays you have so many apps and social networking sites where you talk and have conversations. Managing anxiety disorder here refers to control your anxiety of speech. The greatest fear of human is public speaking. It is very normal that a person may feel shy or hesitant while speaking in front of a crowd. It’s useful to take part in deep breathing before an uneasiness inciting social circumstance. Be that as it may, practice this strategy regularly. Along these lines it turns out to be second nature, and you don’t hyper focus on profound breathing and miss a whole discussion. Each one has some of the other fear. You can’t say that you are fearless. Somewhere deep inside something is there that disturbs you and you can get rid of it, if you face them boldly. You need to be strong enough to face those fears. Some fears are just inevitable and thus such fears shall be dealt with care. At first it will be difficult to make any move but gradually you will learn how to handle it. Be patient with yourself. Don’t try and over do all in one go. Take your time and read your fears and face them. Try and rule out every fear and anxiety. Fear will diminish you in every point. It is genuine for any individual to escape social gatherings due to severe social anxiety. It can help in short term but in long term if you keep avoiding such kind of social gatherings, it will become a major problem. Fear about something is just in our mind and no one knows that what will actually occur. They might not be as bad as our mind thinks it to be. Thus the only way to overcome your fears is to face them. Have the courage to face them, and face them frequently so that they no more remain your fear. One basic problem with every human being is that the start predicting what will happen and start building castles in the air. Think as much as you can handle. Over thinking leads to stress anxiety and eventually becomes a mental stress. Whenever we meet someone we start wondering what the person might be thinking of us. Whether he or she is judging you or not. Instead of focusing on what others think about you, you must do what you think is right. Try and reframe what you think. The people who are shy and have social anxiety disorder have a flow of negative thoughts going on in their heads. So it is must for them to break away from their negative thoughts and become aware of when you fall as victim and by challenging their philosophy. Positive thinking is must but other than that you must also have a realistic perspective. Find different ways to look at things and don’t judge everything in a negative manner. Are you afraid to meet people who visit your place or fear to go to social places? Go and involve yourself in some kind of social activities. Join any club in your neighbourhood. You can also work with some NGO. Doing these will distract your mind. Social participation can make you aware of several things which might help you gain confidence. Start interacting with your co-workers. Social activity can also include some sports activities. Sports activities gear you up and build you to take up challenges. It’s a game but it brings in many kind of obstacles just like life does. You will be able to gain confidence once you involve yourself in all these activities. And then you can overcome your shyness and social anxiety. A friend is someone who makes you happy and also prevents you from being sad, a good friend is the one with whom you can share everything in life. A good friend also is the one who will encourage you to take steps in life and move ahead. He or she helps to make choices between what is right and what is wrong. But a good friend does not come handy. you need to make friends and then find the right one. To do so make new friends. you need to have a friend circle. When you don’t have a good friend circle, who are fun loving and cheerful, it means that you are shy about making new friends or you don’t easily confide upon others. Don’t feel low in front of others. It’s not mere luck that someone will appear in front of you and say that they are your friend. This will not happen. You have to search for the right kind of person. If you are not that comfortable being with people who are very socially active, you can choose one just like you. You can feel comfortable with the person. Find someone who is already looking for friends. Wherever you go look out for someone who is more bubbly and interesting, and you share some sort of similarity. You should have a nice friend circle. That will bring about a lot of change within you. The way we look at ourselves is very different from others. Our perception is complex. It is very unreal that we often don’t see what we are or what we are capable of. It is really tough to identify your talent by yourself. It takes a little longer time to explore your talents but it’s not impossible. Talents are not built in one day. Thus, you need to look back into your past to what hobbies you had in your childhood. Which all hobbies you were good at, what all activities had won you prizes during your school. Think about the things which you thought were challenging. When we hear or come across the word ‘positive’, most of us think about happiness. Having a positive attitude towards every approach in life will make every situation easier. There are various steps to be happy in life. Research proposes that we have capable abilities to pick positive feelings and methods for thinking. Truth be told, our feelings actually change our bodies on a phone level. Many of our encounters in life are a consequence of how we decipher and react to our environment. Luckily, instead of curbing or attempting to “get free” of negative emotions, we can translate and react to them differently. You’ll see that with some practice, tolerance, and persistence, you can turn out to be more positive. Meditation and yoga will always help you in having positive attitude. If you have a positive attitude you can see the colours brighter than ever and this help you recover from the shyness you have. Everyone has their inner self. You must recognize the inner call in you. Initially not many can understand it as it is not that easy. Everybody has a spark within them and can face all problems of the world. Reading is a very good habit that will help you find you inside yourself. Maybe you can relate to a character that has influenced you or excites you. Watch out for the similarities between you and the character. This will help you find your virtues. It’s the best attribute anybody can have. Try not to be pompous or have a low self-value. Let yourself know that you are the most astounding individual on the planet and couldn’t care less if your companions don’t concur. Be social, not a people person. Entertain yourself with school exercises, similar to show or the games club. Athletic individuals are constantly confident about themselves. Other thing that will help be confident, is you smile. It’s a universal solution to every problem. Keep your smile in simple range – you’d be shocked how even the littlest of grins can incapacitate numerous social circumstance and make everybody feel more good.